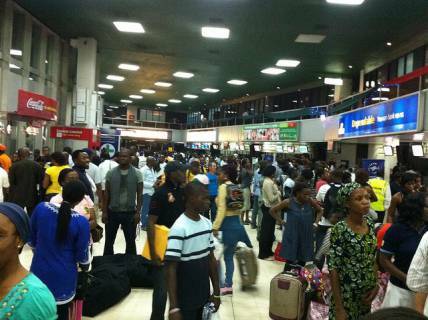 There was pandemonium at the General Aviation Terminal (GAT) of Murtala Mohammed International Airport (MMIA) on Friday following a gunshot which was believed to be an accidental discharge. Two people were injured in the incident when a man identified as an orderly of a Senator accidentally fired the gunshots, it was learnt. He was trying to remove the magazine of his gun when the discharge occurred leaving him and another woman injured. The incident also caused panic within the terminal as travelers and airport workers scampered for safety on hearing the gunshot. Eyewitness report indicated that the security man was to travel on Arik Air and he wanted to dislodge the magazine from the gun in line with standard practice in air travel but incidentally the gun released its bullet. It hit him and the woman on the leg, it was gathered. An eyewitness said, "It is a standard practice in air travel for anyone with a gun to pull out the bullet. This is what the security man was trying to do but incidentally the gun released the magazine which splattered and hit him and the woman on the leg as he bent down to pull out the magazine from the gun". They, however, trekked out of the terminal to the vehicle that conveyed them to the hospital without any assistance. According to the source, the injury was not that severe. General Manager, Public Affairs of Federal Airports Authority of Nigeria (FAAN), Mr. Yakubu Dati, confirmed the incident. He said what transpired was an accident which occurred while the man was trying to remove the magazine from his gun as a standard procedure because guns are not allowed onboard aircraft but they are usually checked in, in the luggage compartment. Dati, who described the incident as minor, assured air travellers that all the airports are safe and secure, adding that in recognition of the security challenges in the country and around the world, security at Nigerian airports has been fortified.